We are still halfway through the Chinese New Year festivities and already cupid is peeping around the door to have his turn at Valentine’s Day. And do we have a fun giveaway for you this Valentine’s! what item on PattyBelle caught your eye – name and link to item if possible. If not the name of the item will do. There will only be 1 winner in each category and will be chosen at random by PattyBelle. I will contact you for your mailing address and forward it onto Pattybelle for them to send you your prize. Contest runs until 12 noon 7 February 2009 (Malaysian time +8 GMT) and I will then close comments and a random winner will be chosen. 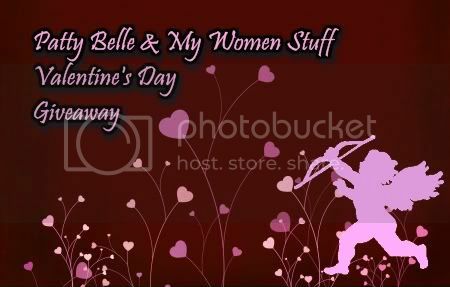 If you have won a gift in any of the 3 giveaways prior to this one on My Women Stuff you are excluded from entering this giveaway. Let’s let others have a chance at winning ok? There will only be 1 winner who will be chosen at random from the comments below. The gift will be sent out by Pattybelle. Please only enter one time or risk disqualification. Winner must respond with your mailing address within 48 hours or the gift goes to the next name on the list. So please supply a valid email address. Please keep this clean and wholesome fun. Hi! I’m from Malaysia. I like Fairy Tales (earrings). Hopefully the B-Fit Somello can help me build muscle and loose fat faster. I love the Erin Putih (Earring)! Hi, I’m from Malaysia. This lash treatment formula looks promising!!! 🙂 Tsuya Tsuya Angel Eyes | Length. hi im from malaysia. Sunshine Cute Little Hair Clip is the cutest thing i like cos of the perfect match colours. Hi, I am from Malaysia. 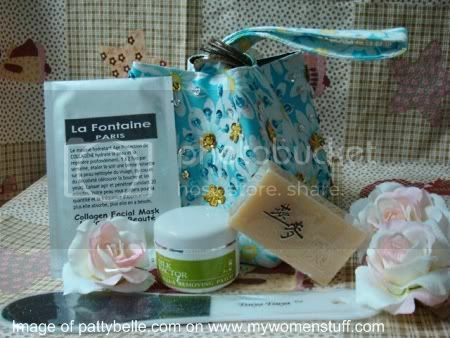 I am interested in the La Fontaine Pure Collagen Facial Mask. Hi dearie. Malaysian over here. I really like the Trseor Collections Flower Black cosmetic pouch. But, it’s sold out! And with good reason! Would have wanted it for myself. Sorry, no link available except PattyBelle’s. Hi, I’m from Malaysia.. The product that caught my eye was Tsuya Tsuya Long Lasting Mascara..
Hello! I am from Malaysia and the cute Cube Bag from PattyBelle’s Art section caught my eye! Hi, I’m from Malaysia. Would love to try the Tsuya Tsuya Callus Removing Patch. 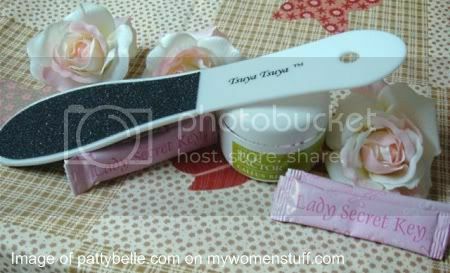 I recently got myself the Tsuya Tsuya Foot File, and it has worked wonders for me. Its easy to use, effective and has saved me many visits to have the hard skin on my feet removed at the nail parlours. Hello…I’m Malaysian. I like the La Fontaine Skin Care Range..Pure Collagen Facial Mask..wonder how’s the effect.. I am from Malaysia, the item that caught my eye are the A-Yuan Liquorise hairsoap(Yuan Soap ). hello there…i’m a Malaysian and i was attracted to the Tsuya Tsuya Nail Colours because of the funky colours and catchy colour names….